1. I always recommend that everyone listen to Ira Flatow's radio show Science Friday (it's the Friday edition of NPR's Talk of the Nation show, available on most NPR affiliates). One can also sign up for the podcast at www.sciencefriday.com or at the NPR site. Sometimes the show gets (in my opinion, anyway) bogged down in tedious health/ pharmaceutical/ medical topics, but it very often deals with exciting technological matters and wild super-science. I mention it because it's good fertilizer for the imaginations of sf writers. Today they discussed new information that indicates that our galaxy is much larger and faster-moving than was previously suspected. For many years, it was believed that the Andromeda Galaxy was much larger than ours. Not so, evidently: our galaxy is about as big and spins 100,000 mph faster than previously estimated. The downside is that the future collision of the Milky Way and Andromeda will probably happen much sooner than planned...but it's still billions of years off. 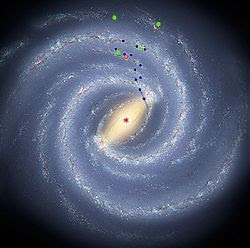 The image here is of an artist's conception of our galaxy from the show's site. More interesting ultimately (but not available to look at yet) is a new map of the galaxy that astronomers are gradually composing by using new and better techniques to plot the locations of observable objects. 2. I'm getting close to throwing the switch on the M-Brane mag. I don't think I can wait until 2/15 to release #1. I have a couple of minor things to resolve yet, but I'm getting really close to just going ahead with an early release. It may be the case, however, that the availability of the print edition comes a bit later than the PDF edition if I race ahead like this. I'll have an announcement on it soon, I think.